← San Diego, California. April 2nd, 2011. Atlanta, Georgia. April 3rd, 2011. 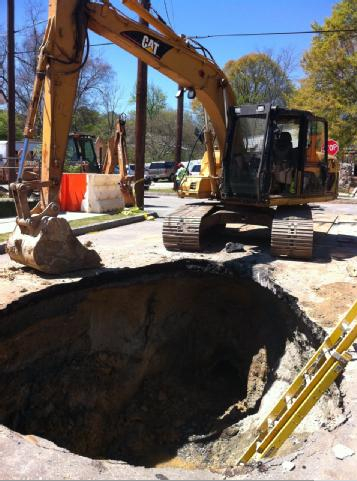 Crews worked to repair a massive sinkhole in southwest Atlanta on Sunday. It is several feet wide right in the middle of Mary Street. At first, residents said they weren’t too concern, concerned. They said it was just another decent size Atlanta pothole. But then the bottom fell out. 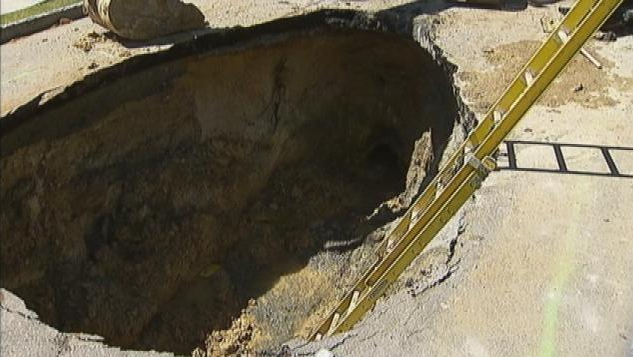 Just a trickle of water runs at the bottom of the sinkhole Sunday afternoon, but Pittsburgh Neighborhood residents said heavy rains last week led a hole large enough to swallow a car. As city crews begin repairs, residents told Channel 2’s Tony Thomas at first they couldn’t get the city’s attention. “So, it was real small at the beginning. Yeah, about the size of a tire,” neighbor Tonie Anderson said. But then as cars drove over steel plates installed by the city, “It got bigger and bigger and the next thing we know it caved in,” Anderson said. 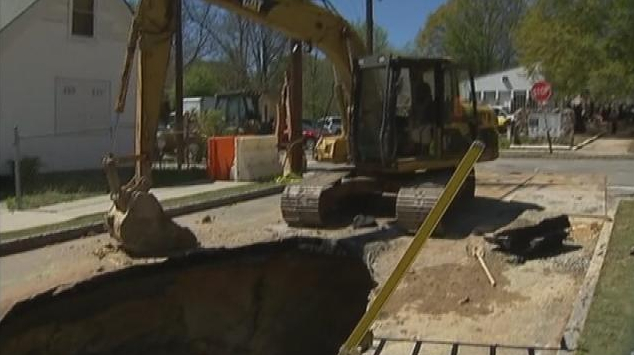 Sunday afternoon, Thomas watched crews repair a pipe at the bottom of the sinkhole, the first step in what workers said it could be a lengthy repair job. Residents told Thomas they’re just glad it’s now blocked off and getting attention. “This could have been a catastrophe not only for a car but for a kid,” neighbor Kenneth Edwards said. Workers told Thomas they would continue to work into the evening. One end of Mary Street will remain closed until the repairs are made. This entry was posted in Pictures and tagged Atlanta, Georgia, sinkhole. Bookmark the permalink.